Some things are worth persevering with. Take my blog for instance. Goodness I have learnt a lot in the six years since starting it but it still frustrates me. I thought I had succeeded in putting up drop down menus. Not quite. The formatting of the posts is now a bit out. I will get it sorted. Eventually. 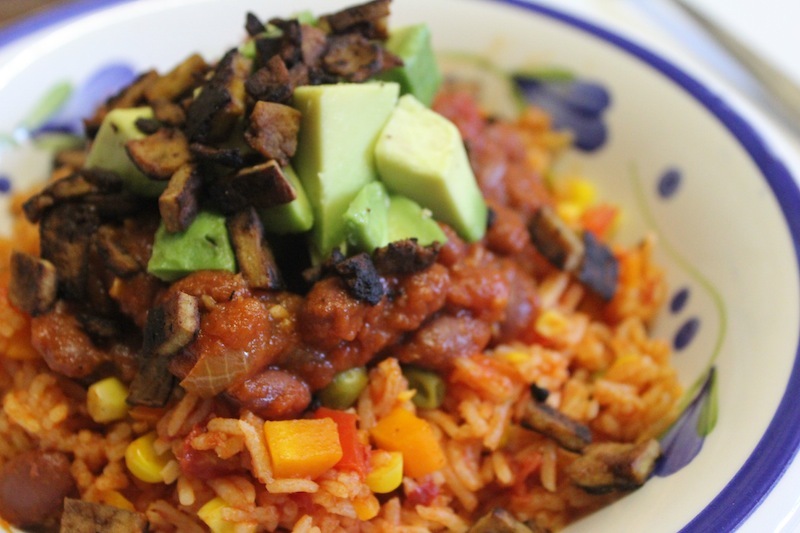 I thought finding a good basic recipe for Mexican Rice would be easy. Such a common dish in Mexican cooking couldn't be that difficult. It ended up being a long journey. I started making it last year. After burnt saucepans and dry microwaved rice, I finally had success this week. It was well worth the perseverance. I started with two recipes. 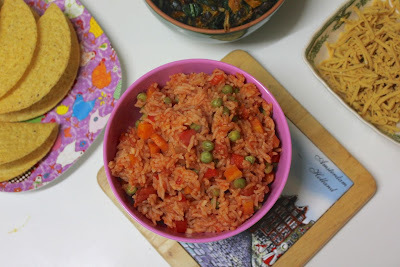 One from a trusted old cookbook, A Vegetarian Feast by Vikki Leng, and one from a superstar blogger, The Pioneer Woman. I factored in my preferences for minimal spice and lots of vegies. I simmered it on the stovetop for 12 to 15 minutes. 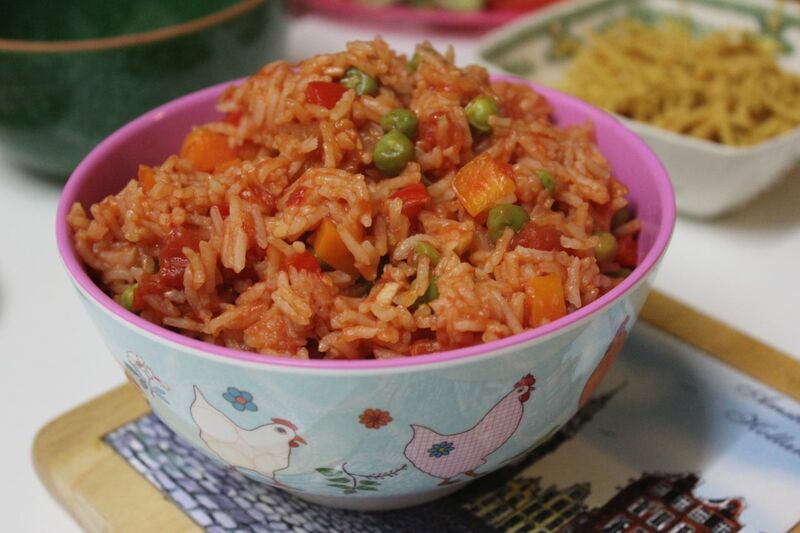 As you will see from the above saucepan, I had trouble with the rice sticking to the bottom of the saucepan. It didn't make for much fun washing the dishes. The rice tasted good. It was an excellent combination with tacos. kidney bean stew, guacamole, yoghurt and spinach. The tacos were more substantial. It still needed more work. I really wanted to have another go and leave less burnt rice behind. Yet again, I ended up with another charred saucepan. And yummy Mexican rice. This time I served it with soft tortillas, kidney bean stew, roasted mexican green beans and cashew crema. The beans were adapted from these brussels sprouts but were too stringy for my liking. The cashew crema was really good (see recipe at bottom of post). Dinner was delicious but the rice just wasn't right. Then I decided to try making the Mexican rice in the microwave. This would make sure there were no burnt saucepans. In retrospect it seems odd I didn't search the web for how to do it but my notes just show that I went to taste.com for information on how to cook rice in the microwave. I ditched the onion and olive oil. You will also see that I have added black pepper and chopped parsley for serving in the recipe below, yet I kept forgetting to add it in any of the photos. I have left it there as a reminder. It worked. 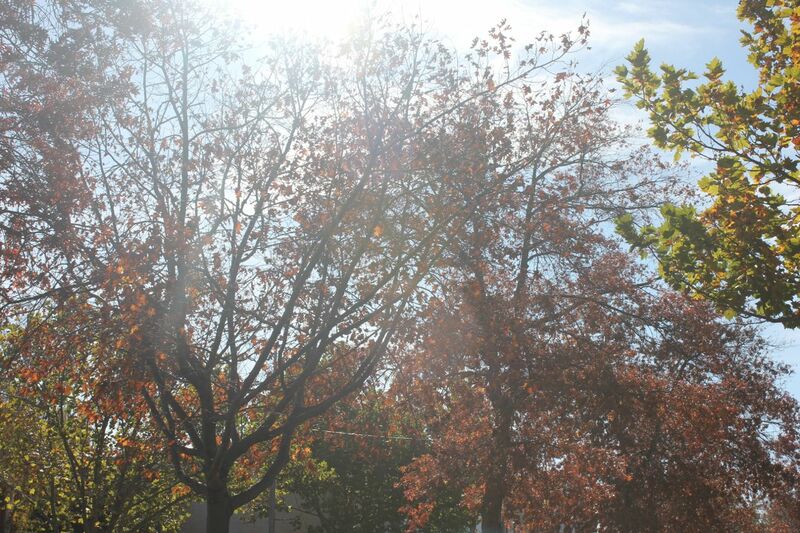 The colour lost its burnt brown tinge and was bright red. The first time it was ok. I only added three quarters of a cup of water and cooked it for 4 minutes then 3, 3, 3, 2, 2 (total 13 minutes). It worked but was a little dry. Possibly this is why I served it with a tomato and bean stew. The tofu bacon and avocado on top were particularly good. I liked the corn in the rice but often have corn on the side so don't tend to add it regularly. The rice still wasn't quite right. More experiments were needed. Finally this week, I tried it again. This time I upped the water to one and a half cups and I cooked it for 5 minutes and then 5, 5, 3, 1 (total 19 minutes). It was just right. I serve it in tacos with onion, kale, pumpkin, black beans and soy cheese. The vegies weren't quite seasoned enough but the rice was so so so very good. It was my eureka moment. Even if others have been there before me. I am aware that microwaves vary in power (if you have one) and whenever you alter the amount of ingredients it can affect cooking times. 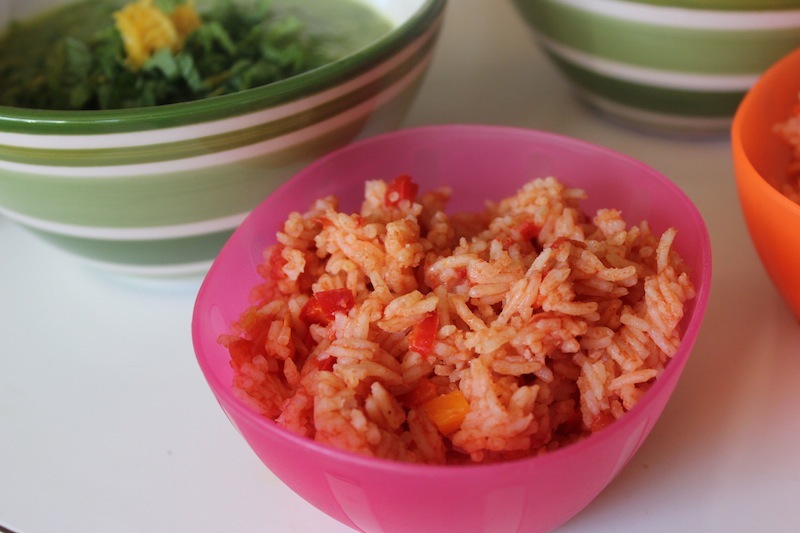 You have probably noticed that it is not the quickest way to make Mexican rice. It was quicker on the stovetop. And it is possibly not quite traditional. Yet this recipe works for me. And along the way I have had fun experimenting with how to serve Mexican rice. I am sending this to Ricki's Wellness Weekends. Choose a large microwave proof bowl and something to cover it with. I have a plastic cover with vents that fits perfectly over my large purex mixing bowl. Place carrots, capsicum (and fresh corn if using) and 1/2 cup of water in bowl. Cook on high for about 3 minutes. Add garlic and cook anothe minute. Now add remaining ingredients and microwave for 15 minutes, stirring after each 5 minute interval. At this point check the rice to see if it is soft. I gave mine another 3 minutes and then a minute. (ie the closer it gets to being done the more often you check the rice.) My microwave is not a powerful one so others might be quicker. It is ready when the rice is just soft but there is still a little liquid left. Leave the rice covered for about 10 minutes out of the microwave and some of the liquid will be absorbed as the cooking can continue once out of the microwave. Check and adjust seasoning. Grind some black pepper over it and then scatter with fresh parsley if desired. 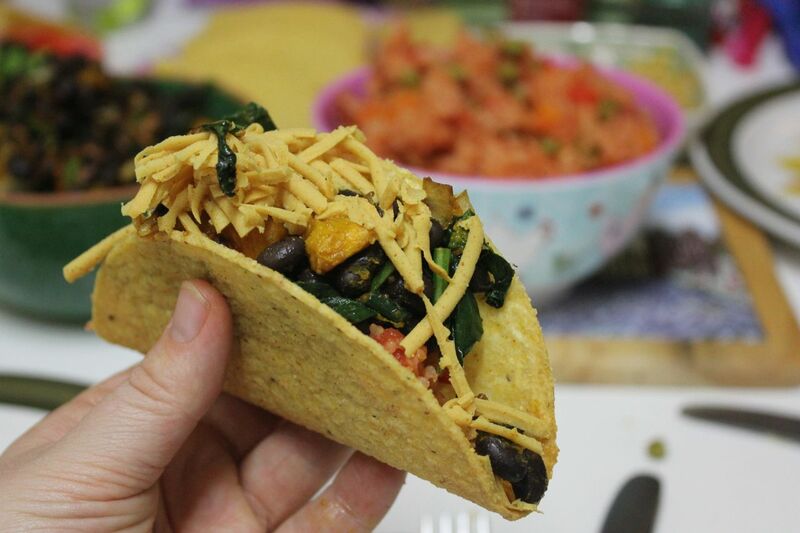 Enjoy with your favourite Mexican dishes. I recommend a legume dish like kidney bean stew, something creamy like cashew tofu crema (below), yoghurt or guacamole, something green like spinach or lettuce, and some tacos or tortillas. 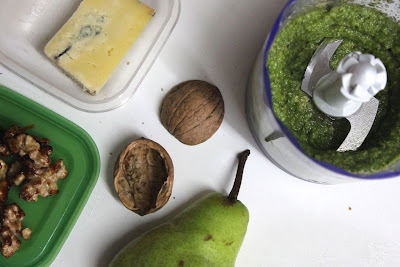 Blend in a blender or food processor until creamy. *Update July 2014: mad this tonight in food processor because little blender broken. The nuts didn't seem to blend at first but were not much noticeable in the final crema. I added a tbsp of cashew butter anyway to make sure it was creamy enough. 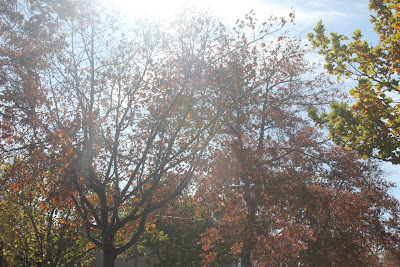 You may have noticed some changes in my blog today. Some odd formatting. Some broken links. Consider it work in progress. Much like this post. Thanks to Kari's fantastic post - How to create drop down menus in Blogger - I am working on drop down menus. However I am still mopping up. When I have got it sorted I will write more about the experience. Meanwhile, please be patient. 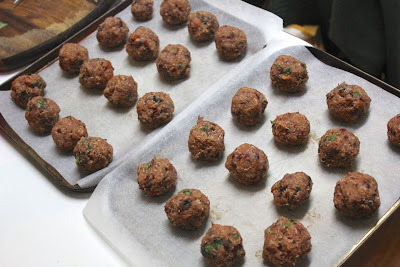 Yesterday I made a batch of quinoa pizza balls and planned to take a few quick photos today, tell you that they were slightly disappointing and then tell you about the last picnic I had. 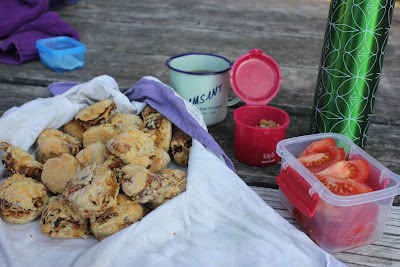 After all I had made them for Louise's Picnic Game. Then I set up the quinoa balls like a picnic and Sylvia and E decided to join in and we had a fun picnic at home where we enjoyed the balls. Finally before I could write the post we find outselves in the midst of a change of prime minister. 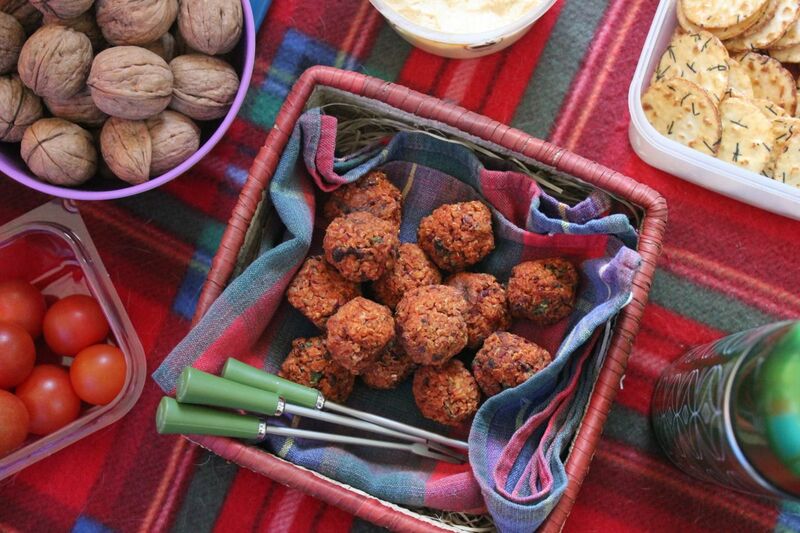 Goodness it is hard to concentrate on these quinoa pizza balls. 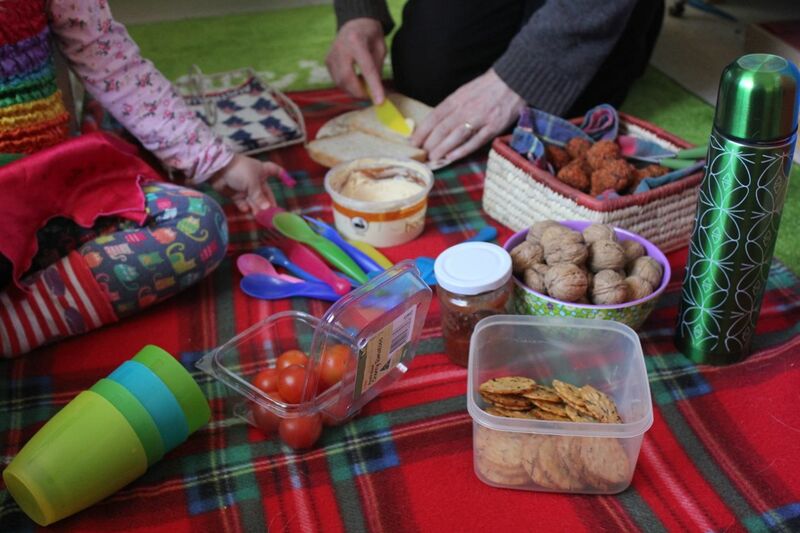 Being the middle of winter, we haven't have many picnics lately. The last one was back in May when we went on Puffing Billy, the iconic steam train that chugs its way through bush on the outskirts of Melbourne. Before leaving home, I whipped up a batch of cheeseymite scones , packed them along with some walnuts, tomatoes, lamington bars and a thermos of tea. It was simple but excellent. 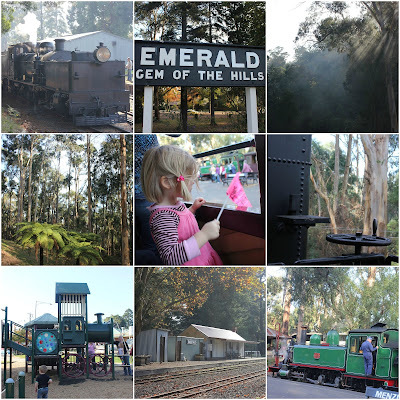 We took the train to Emerald and ate our picnic at some tables by the railway line. A charming place for a relaxing lunch. Puffing Billy is a special treat. It is not cheap. However we were really impressed at the way they made room for us on a full train when we arrived late. Travelling close to the engine was very noisy. Sylvia had her fingers in her ears a lot of the way. Coming back we had open air seats looking out at the bush. This is God's own country. 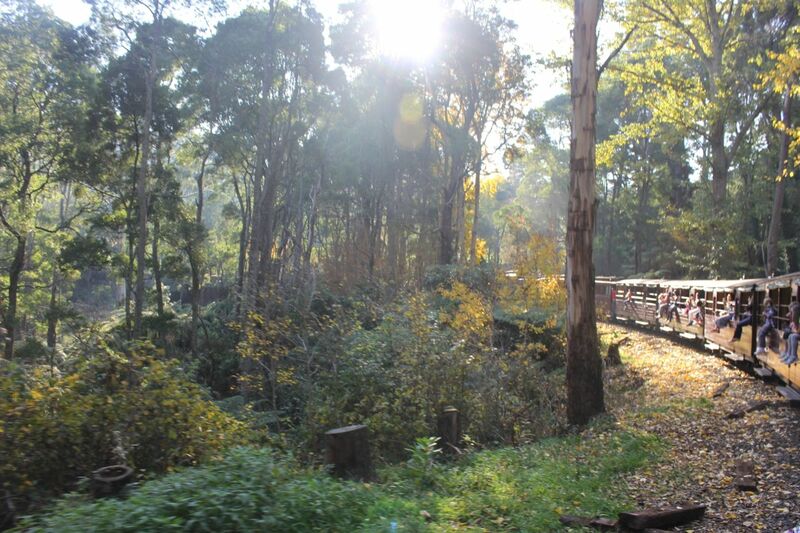 Spectacularly beautiful with the sun lighting up the smoke that filtered through the majestic gum trees. It made me think of my ancestors travelling by steam train through the bush before so much of it was cleared. Now back to the Quinoa Pizza Balls. The recipe came from Ricki at Diet Dessert and Dogs. It is just the sort of snacky balls that I love. However some tomato paste did not seem to warrant the 'pizza' in the name. So I added some tofu bacon, sun dried tomatoes and olives. At first I was not sure they made a difference. Later I decided I quite liked the chewiness of the bits in the balls. Perhaps my main problem was that my favourite pizza ingredient was missing. Cheese! (Ricki is vegan and more used to cheeseless pizzas than I.) I meant to add either dairy cheese, soy cheese or nutritional yeast flakes. I forgot. I was distracted. Maybe next time. I think nutritional yeast flakes would work well for extra flavour and thickening. The mixture was quite wet. It looked disturbingly like raw mince meat. At least it didn't taste like it. 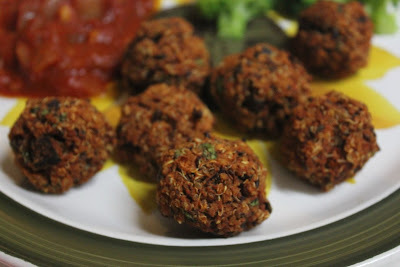 I made these balls for dinner and served them with a simple tomato sauce and steamed broccoli. Don't do this, my friends. The balls tasted overwhelmingly of tomato. They don't need more tomato sauce. I liked them far better today at room temperature with hummus. As I mentioned above, this post is written as part of Louise's picnic game. (You remember the game you played as a child, I went on a picnic and I brought along apples, then the next person brought bananas and the next cucumber.) She holds this every year. 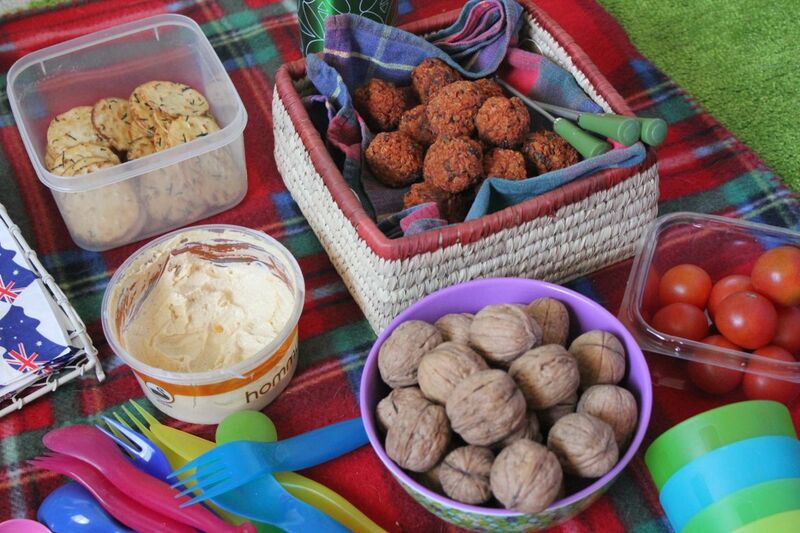 Louise chooses this time of year because it is International Picnic Day on 1 July. Everyone takes a letter to help choose a recipe to make. I took part in 2010. I finally had time to take part again this year. But to return to Australian politics. It is a mess. It saddens me. First we had Kevin Rudd as Prime Minister. Then Julia Guillard took over. Kevin Rudd was upset at being turfed out. He wouldn't let it lie. Now Kevin Rudd is back as Prime Minister elect. No wonder Antony Green called him Kevin Guillard. So there goes our first woman prime minister. Much for our nation to reflect upon. We can expect some interesting discussions at picnics and dinner parties in this country. Bring the quinoa and stock to the boil. Simmer for about 20 minutes or until all stock is absorbed. Mash kidney beans and mix with remaining ingredients. 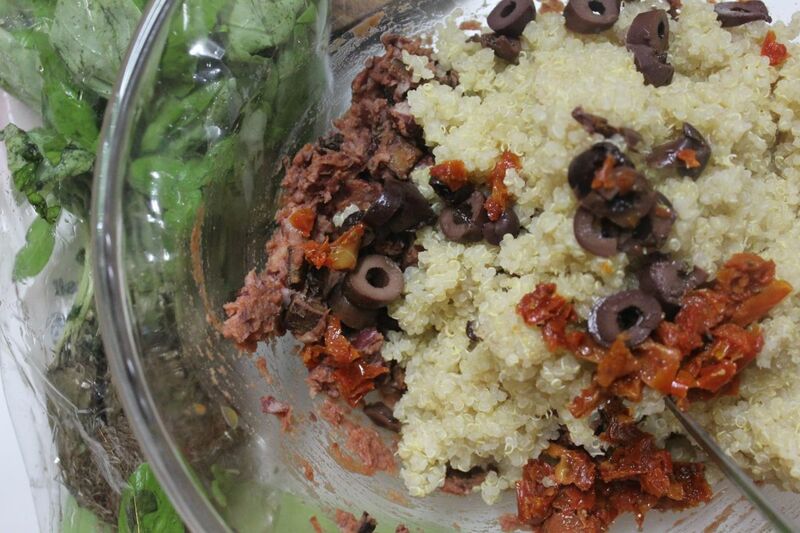 Stir in quinoa when it is cooked. Roll mixture into balls the size of golf balls. Bake until crispy and brown on the outside. I baked mine for about 45 minutes at 200 C in my slow oven - Ricki advises to bake hers for 25 - 35 minutes at 180 C, so you may need less time for more powerful ovens. I preferred mine room temperature with hummus the day after baking. 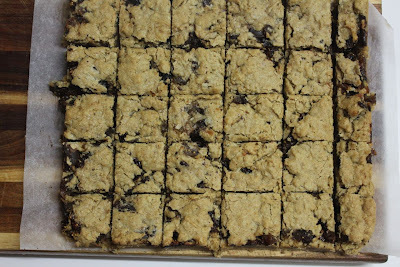 They can also be eaten straight from the oven or kept in the fridge a few days. 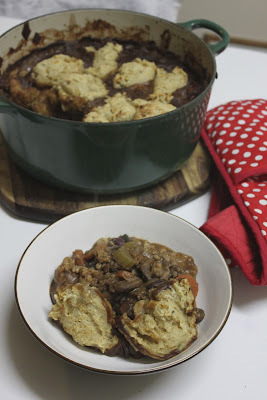 *NOTE: This recipe feels like work in progress because I would try changes, despite enjoying it. I am not sure the tofu bacon, olives and sun dried tomatoes are essential. The garlic was quite strong on the first night but better the next day. Possibly less would be better. I would also try adding nutritional yeast flakes or cheese for more pizza flavour. This morning I went for a swim and afterwards I was happy. Not bursting with happiness at big life changes. Just feeling good about little stabs at happiness. Perhaps it was the swimming or the winter solstice heralding longer days or the fruit mince slice waiting at home. So after some recent cranky posts, here is a happy one. Yes, as I left the pool, life felt good. I had left E and Sylvia happily building bunk beds for her dolls using cardboard boxes, rulers and masking tape. I walked out onto a clean verandah that we had brushed and mopped yesterday. I had swum a kilometre. I had good bread and fruit mint slice at home to eat for lunch. I thought about yesterday. 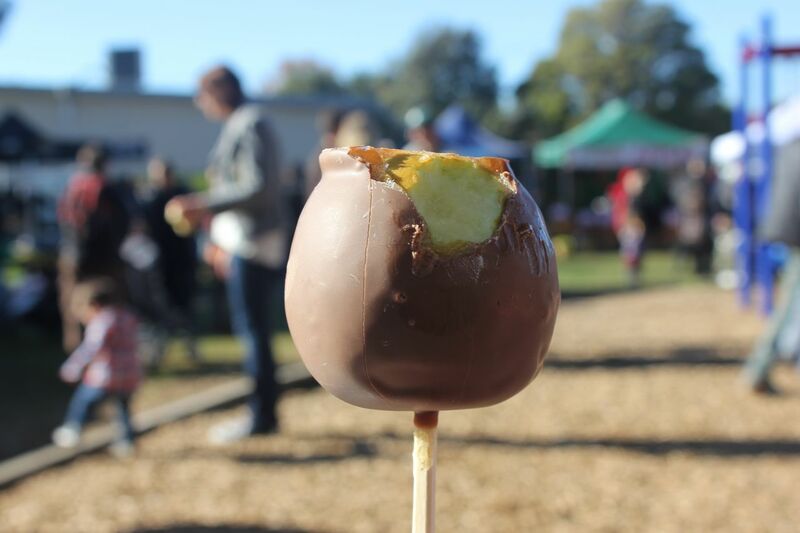 A walk to Coburg Farmers Market to buy fruit and vegies, talk to stall holders about what I had made with their ware (the chocolate pasta lady could not believe I served it with ragu) and share a chocolate toffee apple in the sun. We ran into a friend whom I have been meaning to contact for too long. I love farmers markets for the unexpected finds. 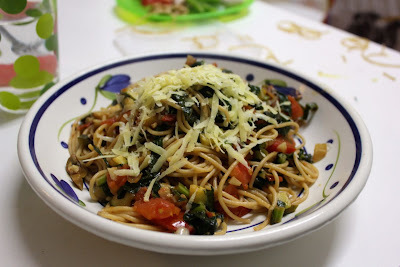 We bought capsicum and spinach pasta, dried nectarines and ginger chocolate. It was very exciting to find romanescu cauliflower and golden beetroot. 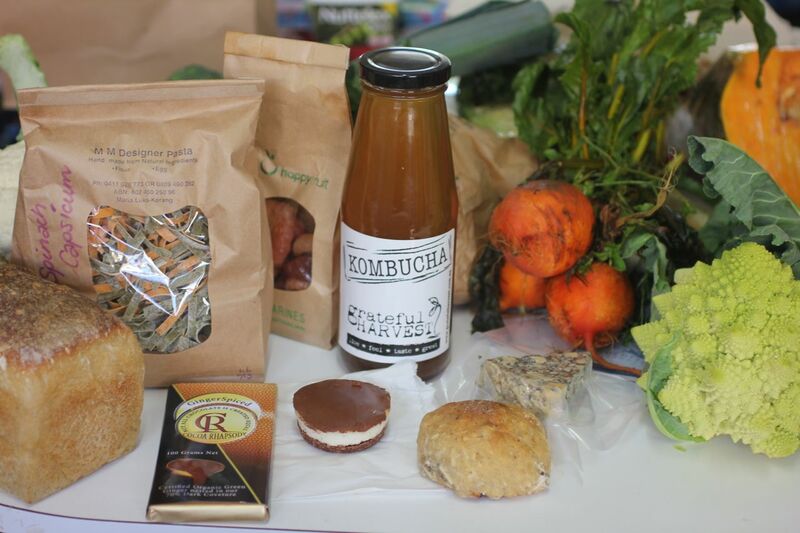 Then as we were about to leave I found myself intrigued by the kombucha stall. Kombucha, a fermented tea with many health claims, is not something you see often around these parts. This may explain why the woman at the stall was so forthcoming with information about it. We walked away with a bottle as well as a raw choc mint tart. 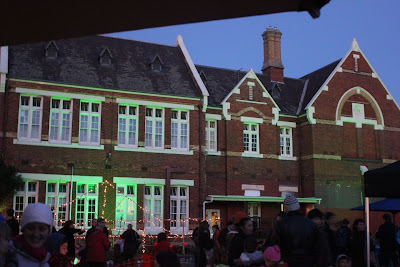 In the evening we went to Brunswick South Primary School for their Winter Solstice Festival. 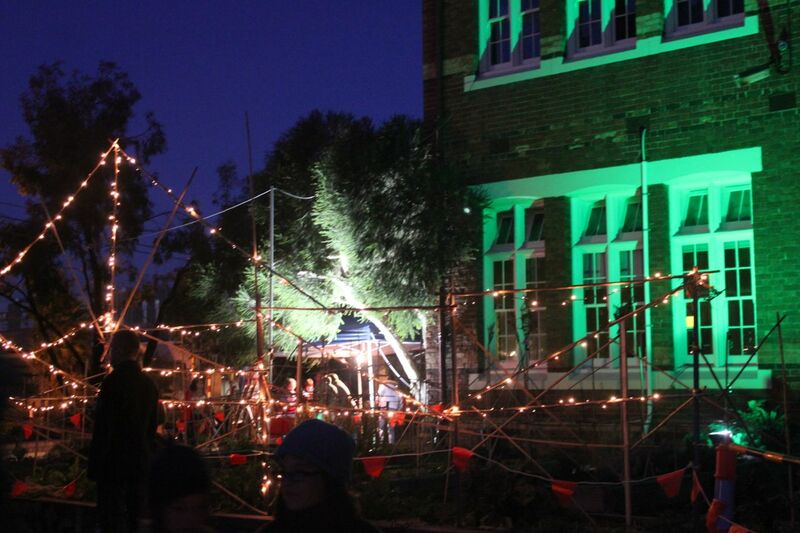 As an aside, I am gladdened to see more winter solstice celebrations happening in Melbourne (Collingwood Children's Farm and Federation Square were other places holding events). It really does cheer up a gloomy winter. While Christmas brings joy to winter in the Northern Hemisphere, I hope that we can embrace a wintery festive season here and enjoy Christmas twice a year. 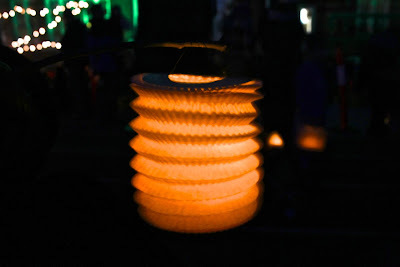 When I had read that the solstice celebrations included a lantern parade I thought we would be watching it. Instead everyone walked around the school in a spectacle of bobbling lights. As we walked we recognised one of Sylvia's kinder friends beside us. It was lovely to walk along seeing Sylvia's and her friend holding hands and carrying their lanterns. 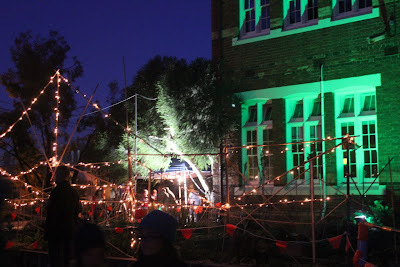 Then we watched the lighting of the bonfire (much smaller than I remember in my childhood and fenced off so there was no toasting marshmallows or any other activities that might threaten health and safety). It did look great with the school lit up behind and the fire dancers twirling in front of it. 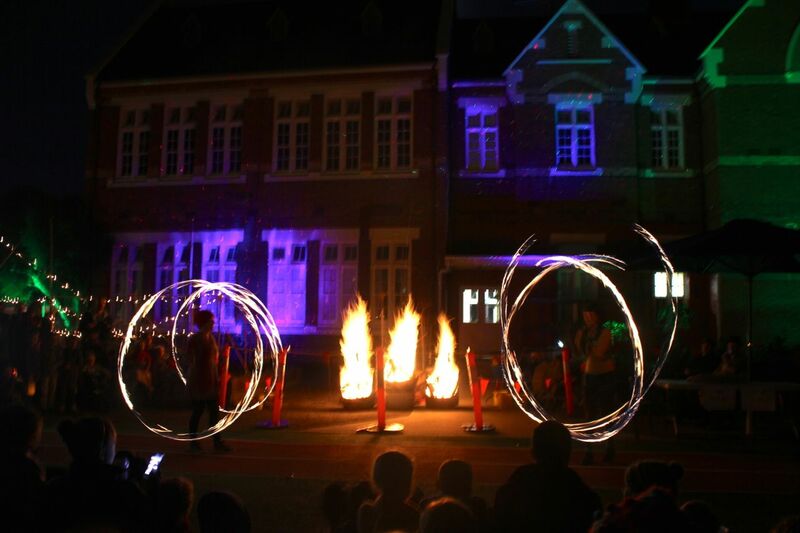 There was soup and pizza available but by the time the fire dancers had finished, we were ready to go home. We considered tinned soup and toast on the way home but the lure of the brightly lit fish and chip shop was too enticing. 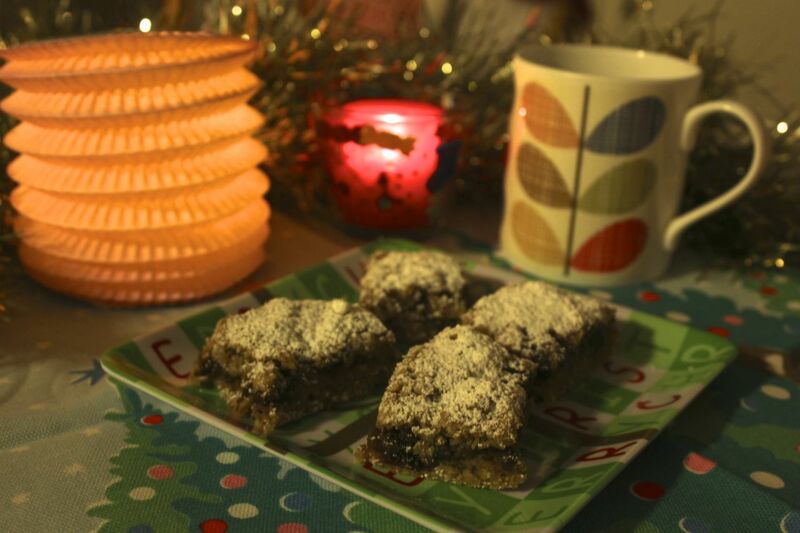 After Sylvia had gone to bed, we watched a movie called The Wicker Tree (not nearly as good as The Wicker Man) with hot chocolate and fruit mince slice. 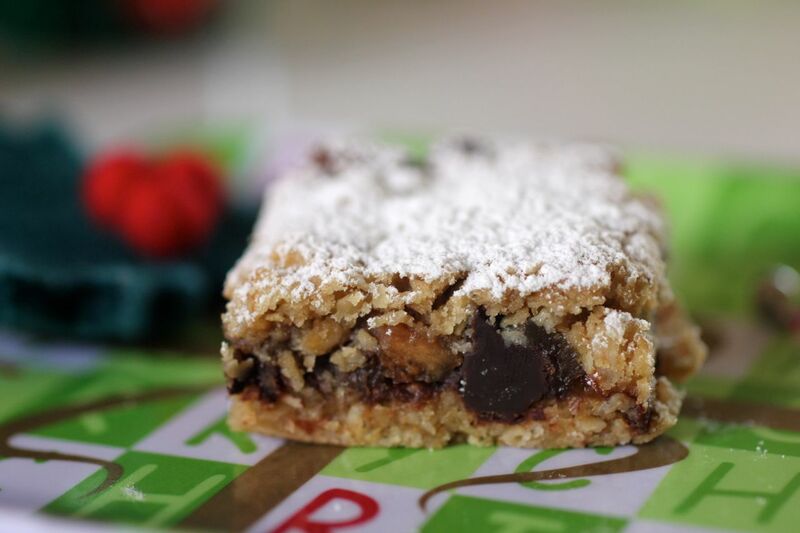 The fruit mince slice is perfect winter solstice food. I saw the recipe at Christmas time on Chocolate Log Blog but summer is really not the weather for fruit mince and I find that the last few years it has sat in my fridge until the weather cooled. I loved how Choclette's fruit mince had chocolate in it. So I added some chopped chocolate which was delicious but hit and miss. In retrospect I suspect that Choclette's fruit mince had cooked the chocolate into it and would like to try that. I made this slice just before picking up Sylvia from kinder and was rather pressed for time. I gave it exactly 30 minutes as the recipe said - though I turned up the oven a little. In an ideal world I would have let it brown a little more. I also absent-mindedly used a little less butter and a little less flour than Laura at How to Cook Good Food. 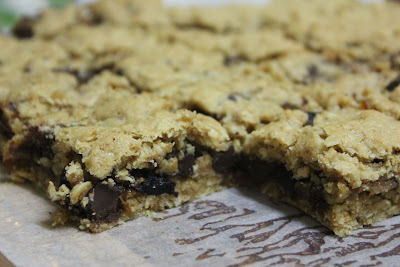 I think a bit more oats in topping would have made the dough firmer and crispier. It was best on the day of baking. E and Sylvia had a piece each crumbled over strawberry yoghurt. Sylvia loved the slice - but without the fruit! E thought it would be delicious with cream or custard for dessert. I love it with a cuppa tea. Preheat oven to between 170 to 180 C (See my Oven Note below). Grease and line a square 22cm cake tin. Cream butter and sugar (but beaters or hand - I used nattalex and just stirred mine vigourously with a spoon). Stir in flours, oats and bicarb of soda. Spread about three quarters of the mixture into the prepared tin. This isn't easy - best to drop little blobs and spread them into each other. Mix fruit mince, grated apple and chocolate. Gently spread over the base in the cake tin. Now spread the remaining oat mixture onto the fruit mince mixture. 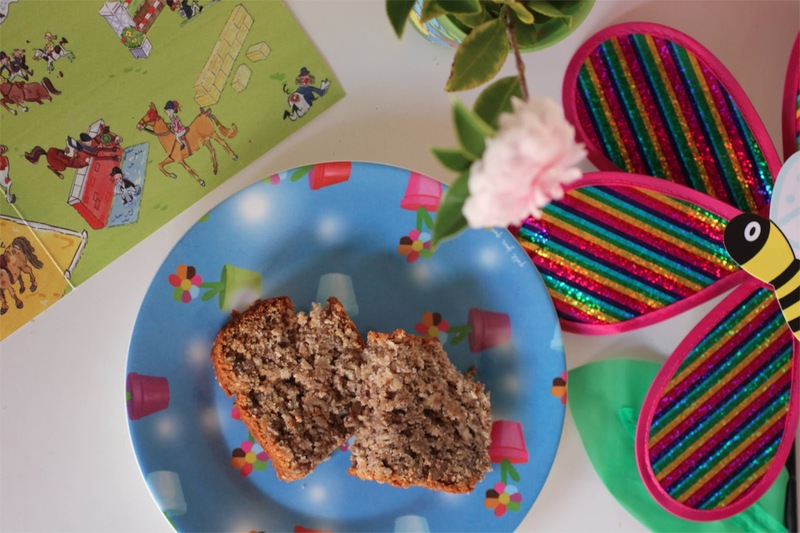 It doesn't have to cover the fruit mince completely. Bake until golden brown. Oven Note: Laura said it took her 30 minutes at 170 C. In my slow oven it took 15 minutes at 180 C and 15 minutes at 190 C and still wasn't quite browned enough. Cool in the tin. Cover in icing sugar (I used a small sieve to scatter it evenly). 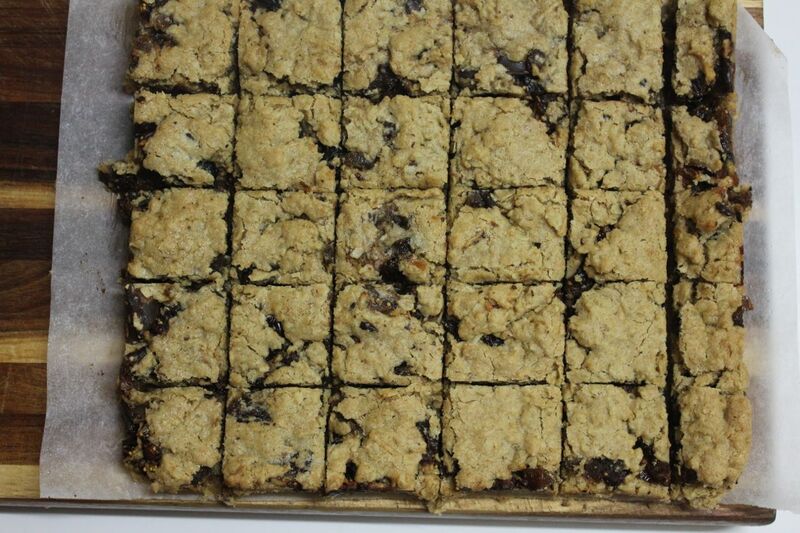 Slice into squares or bars (I cut about 30 squares). Keep in an airtight container (ours has lasted 3 days so far). *NOTE: I used my own home made fruit mince which was made in December. It had dried out a little in the fridge but was also a bit dry to start with. I added apple to give a bit more moisture but might not if using jarred fruit mince. 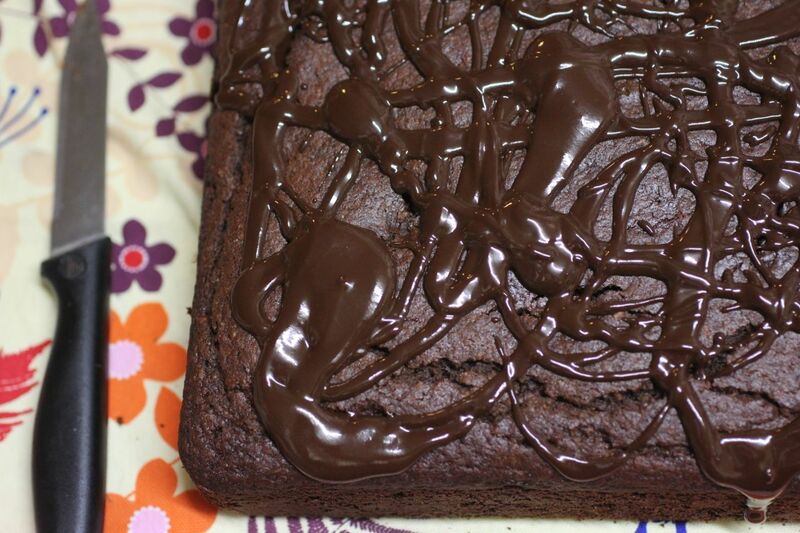 I also thought more chocolate would be good or maybe even heating the chocolate in the fruit mince to have it throughtout the slice rather than occasional chunks. I have been so busy cooking over the past few months that I can afford to be choosy about what I blog. Many good dishes have been photographed and fallen by the wayside. Today I thought I would share a few with you. It would be a shame to forget them altogether. First up is a recipe that I made last week. It is a Mushroom stout stew with mashed potato dumplings from Where's the Beef?. Cindy was right in advising you need a bit of time for this one. I started by forgetting to buy stout and substituting red wine. So you see I didn't follow the recipe exactly. I tried cauliflower in it but that wasn't brilliant. Most disappointing were the dumplings. They were too doughy rather than fluffy. Perhaps my leftover mashed potato had too much milk in it? And next time I might reduce the sugar in the dumplings. However the stew was lovely so I may try again. A far more successful dish I made a few years back was a beetroot green and chickpea curry. 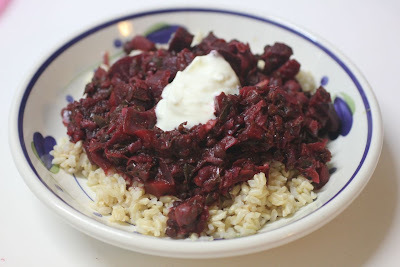 It is one of the few recipes in which I have really enjoyed beetroot greens. So when I bought a leafy bunch of beetroot at the Coburg Farmers Market, I decided to use them in this dish. Yet again it was delicious even though I think I altered the vegies and pulses slightly. Quite some months ago when it was warmer I was inspired by Pinterest to make a Quinoa, cumin and french bean pilaf from In Pursuit of More. It was full of quinoa, green beans, cauliflower, chickpeas, almonds, sun dried tomato, fried onion, mustard seeds, garlic, worcestershire sauce, spinach and parsley. 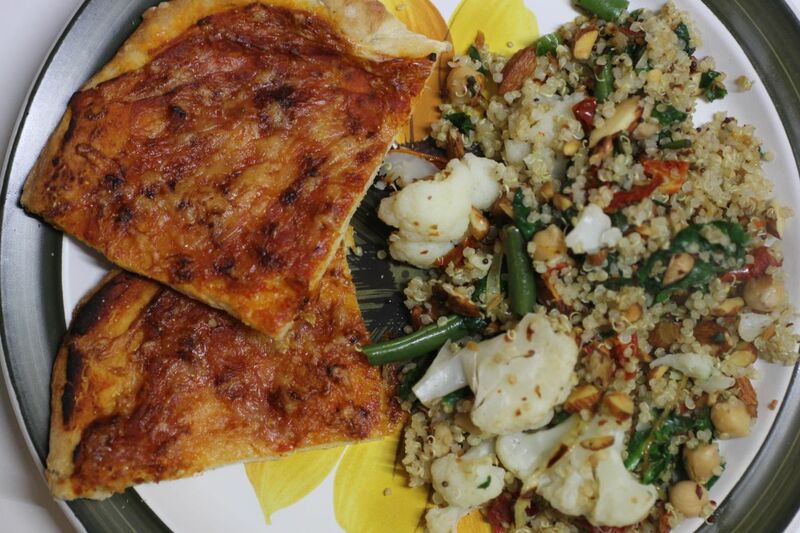 I added in the cauliflower serendipitously and served it with pizza. I remember enjoying it but I have no desire to repeat it. Sometimes when a meal doesn't look as amazing as someone else's photo it can be disappointing. On the Mother's Day weekend I wanted quick healthy delicious potatoes. I made a version of this Potato hash but without the red peppers. It wasn't exactly what I wanted. 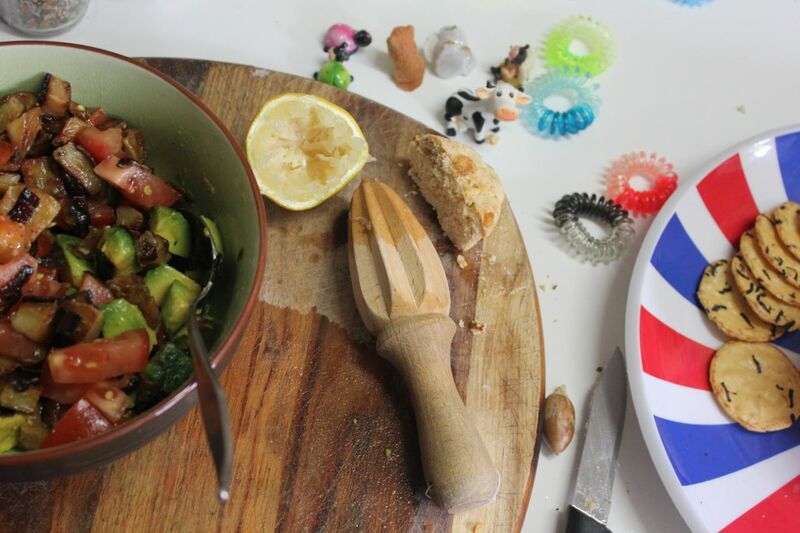 I enjoyed it most the next day for lunch when I mixed the fried potato with tomato, avocado and a squeeze of lemon. Finding myself with 2 bunches of kale after the Coburg Farmers Market, I was inspired by a Food 52 recipe for Spanish Chickpeas with Kale to make this pasta dish. I cooked the kale more than the recipe suggested as I was kid-wrangling at the same time. It was quite good but didn't feel different enough to other recipes I have made to post. I had leftover kale and chickpea pasta sauce. 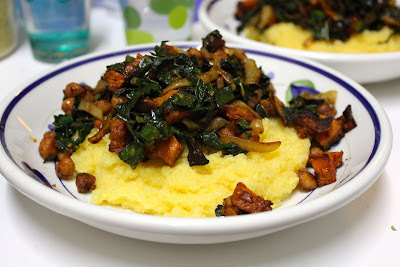 I added in some roasted pumpkin and served it over soft polenta. This was even better than the pasta. I might have posted this if it felt like I had a method. It was just a bit of this and a bit of that. Sometimes that is the best way to cook. The Coburg Farmers Market inspired me to try lots of new recipes as you may see here. I wanted to make the most of my fresh walnuts. They were perfect for my version of a pear, brie and caramelised walnut sandwich by Vegetable Matters. I made a quick and delicious pesto using some potted basil in the back yard that my mum gave me and the wild lime and garlic olive oil from the market. I caramelised the walnuts on the stovetop using hazelnut agave. They were good - as evidenced by us eating a lot out of the tub - yet not quite as carmelly as I would have liked nor quite as sugary as the ones at the market. More experiments are needed. My sandwich with pesto, pear, blue cheese and caramelised walnuts was just lovely and very posh. One good sandwich makes others seem ho hum. So the next day an effort was required. 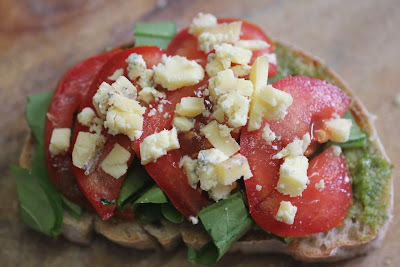 I still had the lovely sourdough bread and packed it with pesto, spinach, tomato and blue cheese. I did learn with these sandwiches that a little blue cheese goes a long way. The rest of the pesto was spread on this pizza. 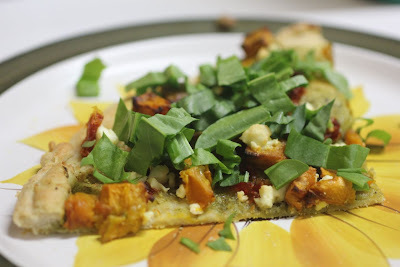 It was scattered with roast pumpkin and feta and popped in the oven. When baked, I topped it with a generous handful of sliced sorrel. The sour sorrrel finished it off very nicely. 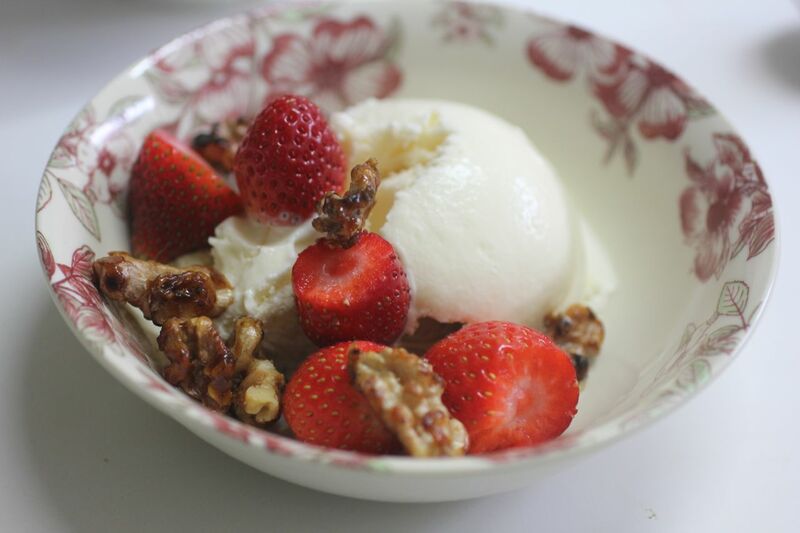 My favourite way to eat the caramelised walnuts was with some strawberries and good vanilla ice cream. I am not usually a big fan of fruit and ice cream. This was amazing. A while back I went through an Emily Rose phase. I have written about her cookbook before. Strangely enough, the more I read it the more I find to love in it and yet I have tried a few recipes that weren't right for me. 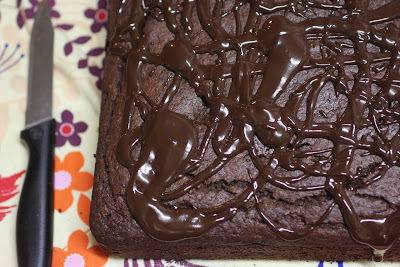 I tried a chocolate coconut slice that wasn't cakey enough for me and more recently I tried a chocolate and date cake. I added coconut to the chocolate and date cake. I told myself that it would then be healthy and full of chocolate and coconut. However you may not be surprised to find I still had a chocolate and date cake not a chocolate coconut cake. I wasn't so keen on the dates. Perhaps because they got in the way of my coconut. I am still seeking my perfect chocolate coconut cake. But I do like how Emily Rose constructs her recipes. 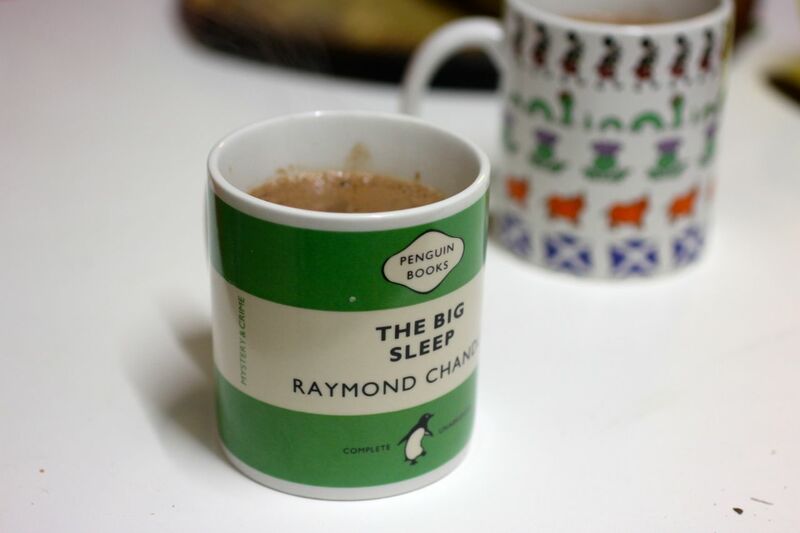 Lastly is a hot chocolate that I trialled. It seemed a good idea. Jamie and Nigella couldn't be wrong. Once I made it I remembered that I don't like really rich hot chocolates. It was just too intense. Since then I have been happy with E making me hot chocolate with a spoonful or two of hot chocolate powder in a mug of boiling water and a splash of milk. 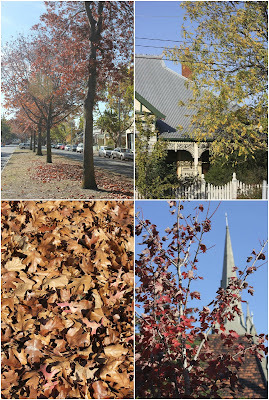 So there you have a peek into what has not been making it onto the blog. Lots of good food. Not always quite right. Sometimes just not for me. Mostly delicious. Last week I was poorly. It was a common cold that found me either cuddled up with a box of tissues or going to bed early. I might well claim that I also had an upset stomach. But this wasn't a result of the cold. It was caused by story after story in the media about poor treatment of women in Australia. Whether it was poor political jokes, army scandals, court cases, or radio interviews, it made me feel both angry and sad. Feminism seemed a far off dream. I have a daughter. I want her to grow up feeling clever, strong and able. I don't just want her to be pretty in pink and in her place. It's not easy. Already she wants to be gorgeous. Fortunately she wants to be so much else. We love doing craft. I love it for encouraging her creativity and teaching her to make a lot out of very little. Above are a couple of recent craft activities. 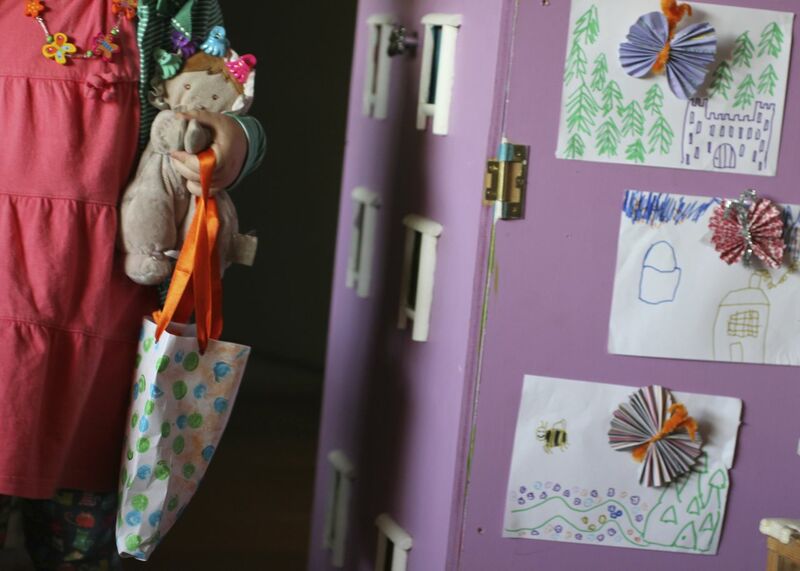 We made butterflies to stick on pictures and then a dotty bag made of paper. I wanted to say something about the women issue in the news last week but had lots else to say. Today I feel like my latest cooking is nothing to write home about so I have dug into my archives and found a bowl of kitcahri that I made in early May when E was poorly. 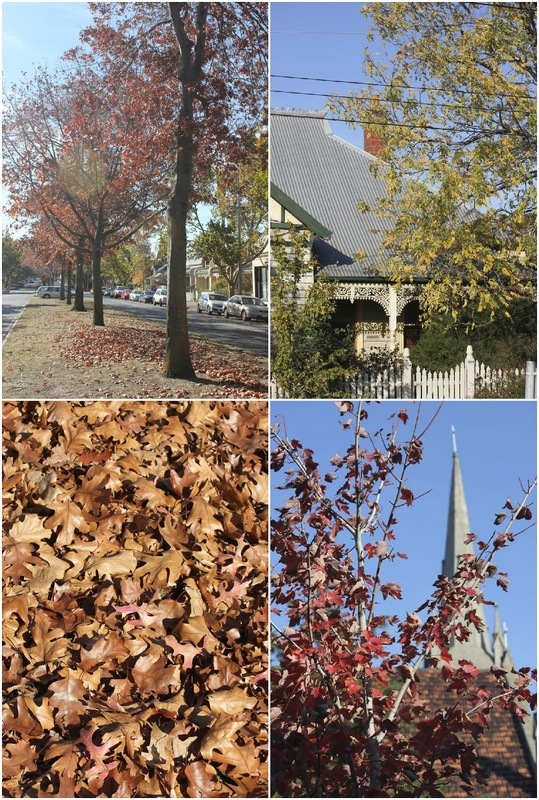 In the spirit of catching up, here are a few of my favourite autumn photos. 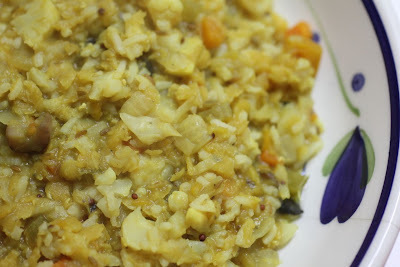 Kitchari (just one of the many ways to spell the name) is an Indian dish of lentils and rice. I had leftover rice and E wanted invalid food. This was perfect. I was inspired by the spices at Dr Oz Show and then added lots of vegies like Ricki. 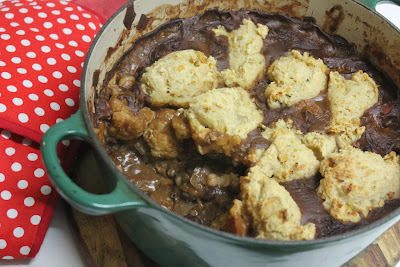 I'd highly recommend it as comfort food for anyone feeling poorly or needing some solace after hearing the latest news. 'I want young girls and women to be able to feel like they are included in public life' Australian Prime Minister, Julia Guilard in response to Howard Sattler radio interview. '...You have the gall to frame this opportunity to work for free as some kind of feminist jamboree.' Catherine Deveney's outraged response to a request by Equal to be part of a debate about the choices Australian women make. 'The standard you walk past is the standard you accept.' YouTube message by Lieutenant-General David Morrison, Chief of the Australian Army message regarding unacceptable behaviour towards women. 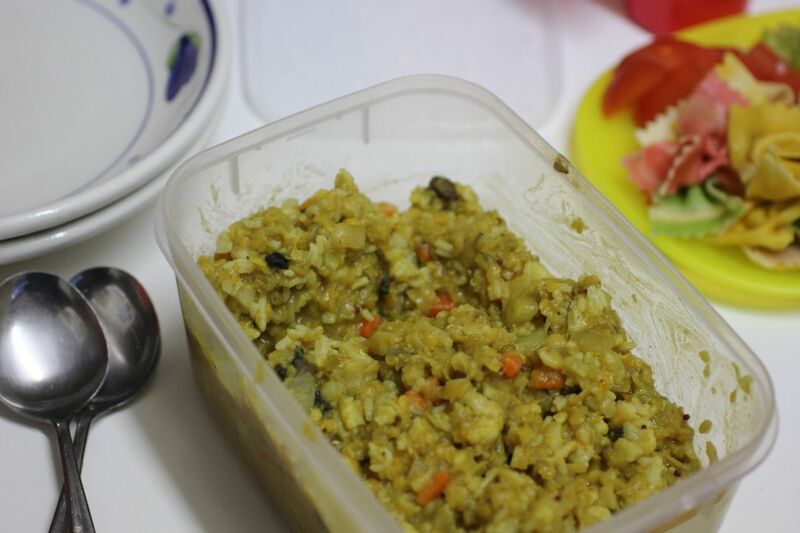 I am sending this Kitchari to Ricki for her Wellness Weekends event. Five years ago: Great Stew of Darkness! Fry onion in oil for a few minutes until softening. Add mustard, cumin and fennel seeds and fry a few minutes until seeds start to pop. Add carrot, celery, garlic and ginger. Cook a few minutes minutes. Stir in ground spices briefly. Add water, lentils, cabbage and salt. Bring to the boil and simmer for about 10 minutes. Add pumpkin, cauliflower, mushrooms and simmer for 10 minutes. Stir in the cooked rice and heat through about 5 minutes. Serve with yoghurt, if desired. *NOTE: Any vegetables can be used here, depending on what needs to be used from the fridge.